Met dank aan Marijke Libbenga (Universiteit Leiden) en Peter Westbroek hierbij onderstaande uitnodiging voor een lezing, die waarschijnlijk velen zal interesseren. 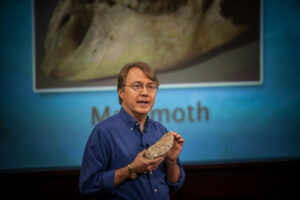 Andy Knoll is the Fisher Professor of Natural History at Harvard University. He received his B.A. in Geology and his PhD, also in Geology (Harvard, 1977). Following 5 years on the faculty of Oberlin College, Knoll returned to Harvard as Associate Professor of Biology in 1982. He has been a member of the Harvard faculty ever since, serving as both Professor of Biology and Professor of Earth and Planetary Sciences. His research focuses on the early evolution of life, Earth’s environmental history, and, especially, the interconnections between the two. For the past decade he has served on the science team for NASA’s MER mission to Mars. Professor Knoll’s honors include the Walcott Medal and the Mary Clark Thompson Medal of the National Academy of Sciences, the Phi Beta Kappa Book Award in Science (for his 2003 book Life on a young planet), and many other medals. He is a member of the National Academy of Sciences, the American Academy of Arts and Sciences, the American Philosophical Society, the American Academy of Microbiology. Paleontology and Sedimentary Geology of Precambrian Terrains; Evolution of vascular plants in geologic time. As the Proterozoic Eon began, Earth was already two billion years old. Nonetheless, Proterozoic rocks provide our first clear chronicle of evolutionary history, documented by well-preserved microfossils, biomarker molecules, isotopic signatures, and sedimentary structures, especially stromatolites. Cyanobacteria radiated in oxygenated surface oceans, but recurring anoxia within the photic zone supported regionally extensive primary production by anoxygenic photosynthetic bacteria. By 1700-1600 million years ago (Ma), eukaryotic cells had gained a foothold in the oceans, adding new morphological and ecological complexity to marine ecosystems. Although unambiguous eukaryotic microfossils occur in mid-Proterozoic rocks, protistan diversity remained relatively low until about 800 Ma, when new types of fossils, including testate and scale-forming taxa, radiated. It is hypothesized that the evolution of eukaryovory – predation by eukaryotic cells on other eukaryotes – provided an ecological driver for Neoproterozoic eukaryotic diversification. Ecology also played a key role in the ensuing radiation of animals, with carnivores playing a role comparable to that eukaryovores in earlier Neoproterozoic ecosystems. Moreover, despite developing the capacity for photosynthesis more than a billion years ago, eukaryotes first gained ecological prominence in marine phytoplankton only about 650 million years ago, reflecting an increase in nutrient availability and further facilitating the rise of animals. The environments within which cyanobacteria, eukaryotes and animals sequentially diversified differed from both those of the Archean Eon and those familiar to us today. In particular, the basal Proterozoic rise of oxygen in the atmosphere and surface oceans permitted innovations in energy metabolism and biosynthetic pathways, although persistent subsurface anoxia likely provided a continuing challenge to early aerobic organisms. Following a prolonged interval of low pO2, the atmosphere and oceans began their transition to a more modern redox state near the end of the Eon. Oxygen availability placed significant constraints on Proterozoic evolution, and renewed oxygenation near the end of the Eon likely facilitated animal radiation, not least by making carnivory possible. Thus, the ecological theater of Proterozoic environments and the evolutionary play recorded by fossils appear to have influenced each other throughout Earth’s long middle age.